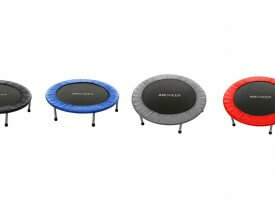 JumpSport 350 a 39 inches mini trampoline which features 32.5 inches of usable Permatron jumping surface and a 4 inch skirt. Its frame and legs are made of high quality, 16-gauge steel, which helps to keep this trampoline stable, partly thanks to 6 pieces of JumpSport`s arched legs, allowing you a much wider range of exercises than on normal, low-cost trampolines. Recommended for: All into serious home based training sessions! 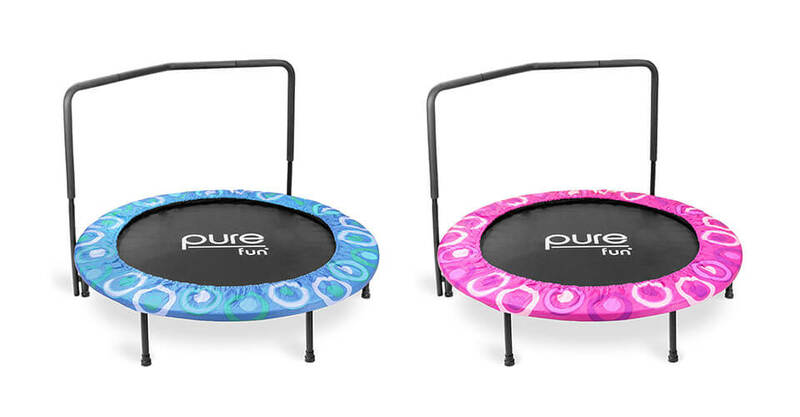 The bounce is very soft, smooth and cushioned, allowing you to exercise for much longer periods of time. This is because this trampoline uses a high number of 30 elastic cords called EnduroLast3, which are tested to millions of bounces without any problems. This means they can last from 9 months to 4 years. It all depends on your usage patterns. The elastic cords are also adjustable and offer various tension settings. They looked secure and we were confident they wouldn’t snap. In addition, the jumping surface is made from material called Permatron, which is the material of choice for all pro & semi-pro rebounders. It will not stretch. There are no worries about being thrown off balance during intense workout sessions. 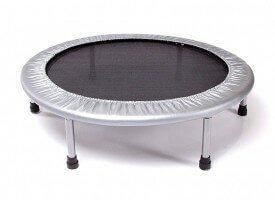 When those two are combined you get very good results – a trampoline that is super strong and of high quality. With 275 lbs weight capacity, JumpSport 350 can be used even by heavier jumpers. So, if you are into losing some weight, JumpSport model 350 is a rebounder for you! Since the trampoline doesn`t use steel springs (uses 8mm thick bungee cords “EnduroLast3″ instead of steel springs), it is very quiet and will not become squeaky over time. In addition, it won’t bottom out and the manufacturer states it reduces impacts on joints by 40% when compared to the standard trampolines. We have no reason not to believe them! JumpSport model 350 vs 250? The main difference between this model and its cheaper brother, the JumpSport model 250, is that the 250 doesn’t have adjustable tension settings and its springs are made of Endurolast 2, as compared with this model’s Endurolast 3. The model 350 is also a bit lighter and its mat is made of Permatron. We think that the springs on this model should last you a bit longer. Both of the models are really good and quality-made. Even though we think the 350 is a bit better model overall, if you’re certain you won’t be needing the adjustable springs and are strapped for money, then you can safely opt for the 250 model. Overall, we fell that the price is well justified considering the features it is equipped with. It reminded us of more expensive and higher-grade mini trampolines costing up to three times as much. The warranty is fairly good. 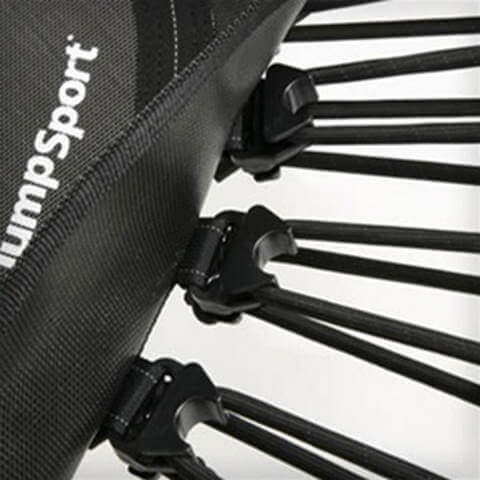 JumpSport offers long periods of fully covered warranty, but it is different between the parts – the steel frame and legs come with a lifetime warranty, the mat has 5 years of warranty, while the elastic cords are covered for 2 years and all other components are under a 1-year warranty. We haven’t had any experience with their customer service, but if the others are to be believed, their service is good and they will often extend their courtesy and may replace parts even after the warranty has expired. The assembly of Jumpsport 350 is not that difficult. It will take you a couple of minutes to get it assembled and try it out, but you can do it on your own. Assembly consists of attaching leg pieces to the sockets on the trampoline frame and simply securing them with a 6mm Allen wrench. Accessory handles are installed with thumb screws, if required. When assembled it is 41 inches wide, so please ensure you have enough room to install and place it. Those two extra inches come from arched legs, which are wider than the trampoline itself. Buy now on Amazon Check other mini trampolines! 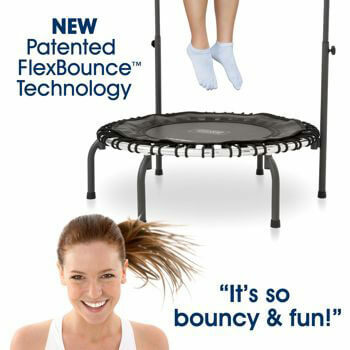 Great fitness trampoline with fantastic consumer reports! 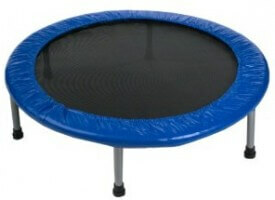 Each and every review you can find around praises quality of JumpSport 350 fitness trampoline. Great choice for all serious training enthusiasts. Recommended!